Japan's PM Junichiro Koizumi has pledged to submit a bill to parliament letting women ascend to the throne. In an annual keynote speech, he said the move was needed "in order that the imperial throne be continued into the future in a stable manner". Under existing rules only men are allowed to become emperors, but no boys have been born into the imperial family for 40 years. Mr Koizumi also vowed to improve relations with China and South Korea. "While there may be differences in opinion or disputes in certain areas, China and South Korea are very important neighbours," he said. Speaking at what could be his last annual address at the opening of the Japanese parliament, Mr Koizumi said the government would submit a bill to reform the Imperial Household Law. He did not provide details of the proposal, or when it would be submitted. But he said it would be in line with the conclusions of a government panel which last year recommended letting women inherit the Chrysanthemum Throne. If the change goes ahead, it would pave the way for Emperor Akihito's four-year-old grand-daughter, Aiko, to become second in line to the throne after her father, Crown Prince Naruhito, the present heir. 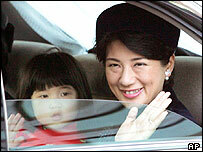 Crown Prince Naruhito and his wife Masako have not yet had a son. Masako, 42, has partially withdrawn from public life due to a stress-related illness, said to be partly induced by the pressure on her to produce an heir. Opinion polls in Japan suggest a majority of people think that women should be allowed on the throne. But some conservatives - including Prince Tomohito, a cousin of Emperor Akihito - have opposed the idea, suggesting instead the crown prince use concubines to produce a male heir. In Friday's speech, Mr Koizumi also said he wanted to debate holding a national referendum on revisions to Japan's pacifist constitution. He also touched on other issues, including his country's frayed relations with South Korea and China. Beijing and Tokyo have been engaged in a number of disputes over the past year, both over oil resources and Japan's attitude to its colonial and wartime history - an issue which also annoys Seoul. Mr Koizumi said that while there may be differences between the neighbours, "we will strengthen co-operation from a comprehensive standpoint to construct future-oriented relations based on trust". Japanese Foreign Minister Taro Aso, a possible contender to succeed Mr Koizumi as prime minister, echoed these sentiments. "Developing Sino-Japanese relations is one of our country's basic foreign policies," Mr Aso is quoted as saying. Mr Koizumi has said he will step down as prime minister in September at the end of his four-year term as head of the governing Liberal Democratic Party.